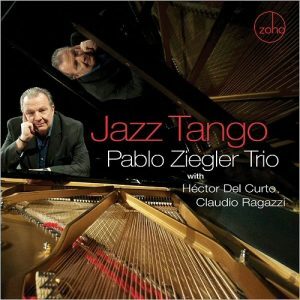 "Jazz Tango," Pablo Ziegler Trio. With Pablo Ziegler’s new CD, “Jazz Tango,” the tango lives and breathes–a common theme in Ziegler’s work; to ordinary people, there seems only so much a person can do with a tango. On this release, the music moves as if it possessed its own blood and limbs, and renders the tango a sinewy and electric thing, a move that impresses old and new fans alike. Fortunately, all the songs are recorded live. There is something gratifying about hearing other people, faceless strangers in this case, applaud a performance that you, the listener, have also enjoyed. It is unclear whether the passion for Ziegler’s work comes from his approach—the task of making the tango new, or if it is the gravitas that comes with being a craftsman of his form. Maybe it is both. The music is enjoyable, and will teach listeners about music, about tango and about Ziegler. In this release, Ziegler, on piano, is joined by Hector del Curto playing bandoneon, and Claudio Ragazzi on guitar. The “bandoneon” is a type of concertina popular in Argentina, Uruguay and Lithuania. The effect the instrument has on this CD is an emotive quality brought about by willowy swells and long, pensive notes. The way all three parts work together for an evocative impression on songs like “Muchacha de Boedo” where listeners can hear the piano, guitar and bandoneon take turns rising and falling, until (seemingly) exhausted, they fade out at the end. This song, like many of Ziegler’s compositions, sound as though they are the movie scores without the accompanying film. “Libertango” is a frantic mash-up of piano and guitar, until, less than two minutes in, the piano begins a spirited motif that the other instruments begin to complement. Roughly a quarter of the way through, the song morphs again, into the tango that many listeners are used to. “Michelangelo 70” is spirited and moody, like an expressive dancer. The word “rollicking” comes to mind at times. The bandoneon is used to punctuate the twists and turns in the song. Listeners can envision the graceful but strong moves of tango dancers. Since his debut album in 1990, “Cuarteto Para El Nuevo Tango,” Ziegler has crafted a career out of joining the traditional to the new and making an art out of it all.